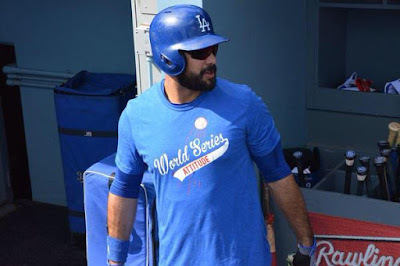 Andre Ethier knows it's all about the right frame of mind... and a playoff beard. BTW, it's now official. Clayton Kershaw will pitch Game 1 and Zach Greinke will pitch Game 2. Also, the Game 3 pitcher for the Dodgers will be Brett Anderson. The remaining games, if needed, have yet to be determined. Ummm.... What? Via Jon Weisman at Dodger Insider, "By Jiminy, cricket coming to Dodger Stadium in November." My first thought was... "those games can take days!" Then I found out that they'll be playing an abbreviated form of the game called T20. I have absolutely no idea how this game is played, but I just might take a moment to learn. This is actually good news for the Dodgers. I was really afraid that Uribe would perform his usual heroics and win a game off the bench. Now, we don't have to worry about that. Via Vincent Samperio at Dodgers Nation, "NLDS News: Juan Uribe Won’t Face Dodgers In First Round." Ryu has started throwing program. 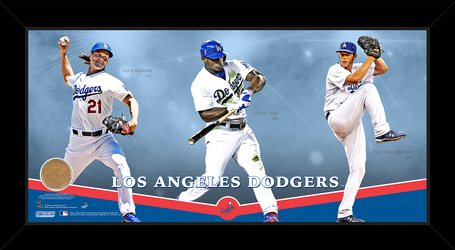 Steiner Sports recently released their 2015 Playoff Collection that includes the below 10" x 20" collage with game-used dirt from Dodger Stadium. Go here to check that out. They also have individual player plaques with game dirt for seven different players. I'm not a particularly big fan of the Topps Bunt program, but I figure this was worth mentioning. Topps Bunt is an app where fans collect virtual Baseball cards, and Topps recently released 20 different 2015 postseason digital cards; including the Clayton Kershaw on the right. Ryan Cracknell at Beckett has more information here. I'm hoping that they eventually put this on real cardboard. Jane Wells of CNBC spoke with Dodger President Stan Kasten to talk playoffs, fantasy sports betting and their new Accelerator program. Watch the video here. On a side note, the Accelerator program is just further proof of how brilliant this Dodger ownership is. They are leveraging their brand as a leader in the game and in sports in general to invest in start-ups that could very well lead to giant returns. What an incredible idea - the Dodgers doing some angel investing. For info on how to legally watch the MLB Playoffs online without cable go here. 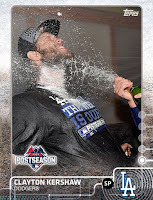 defgav at Baseball Card Breakdown, tears apart an Hanley Ramirez card - just for the giggles. Check it out here. I guess I'll take whoever wants to root for the Dodgers - for whatever reason. Via Big Red Fury, "Why Husker Fans Need the Dodgers to Win the World Series." I have no doubt that the Rangers want their fans to die. Via Kyle Newport at the Bleacher Report, "Texas Rangers Introduce Wild New Concession-Stand Items for 2015 Playoffs." They will offering concoctions like a cotton candy dog and a large bag of Cheetos filled with meat, cheese and other taco-like fillings. A must see! In honor of Back to the Future here is Jaws 19.